A stellar reboot that forges its own path while respecting the legacy of the original. When a celestial object makes their planet gradually uninhabitable, selected families are launched on an interstellar spacecraft to colonize a new region of the galaxy. On the 24th mission of the spacecraft, an alien entity breaches the hull and forces some of the families to evacuate to a non-native habitable but uncharted planet nearby. Maureen Robinson is a brilliant aerospace engineer taking her family to the colonized Alpha Centauri. John Robinson is a pilot and former Marine married to Maureen and step father to her eldest child and biological father to her two younger children. Judy Robinson is the mission doctor with accelerated medical training and Maureen’s daughter from her first marriage. Penny Robinson is the second oldest of the Robinson children with a sarcastic wit and a love of reading. Will Robinson is the youngest of the Robinson siblings who befriends an alien artificial intelligence. Don West is a mechanical engineer who is smuggling luxury goods to sell on Alpha Centauri. June Harris aka Jessica Harris aka Dr. Z. Smith is a criminal sociopath who uses other people’s identities to claim their privileges within the colony. 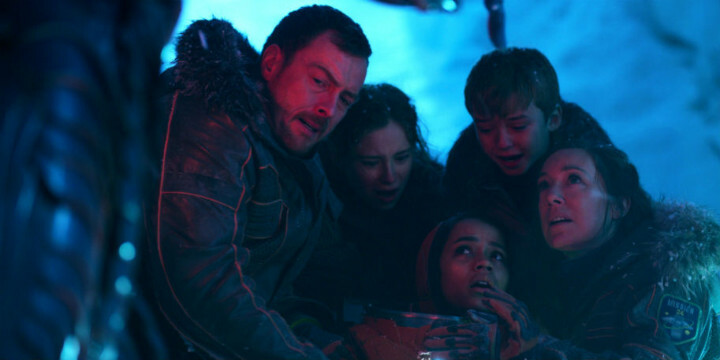 Lost In Space is a 2018 science fiction television series that skillfully finds a way to not only stay true to the heart of the original 1965 television series while improving on the action of the 1998 theatrical release, but also keeps the structure of the 1812 novel The Swiss Family Robinson. This reboot modernizes the things that had to be updated while keeping the message of family clear in each of the the 10 episodes that make up this first season. The cast is excellent in their performances as the characters they portray, for better or for worse, keep you entertained with their heroics and/or villainy. Zack Estrin as showrunner is able to present a tight story that gives the audience the thrilling heights of intergalactic exploration with the emotional anchor of familial interaction. Matt Sazama and Burk Sharpless are able to take the material Irwin Allen produced in the 60’s and infuse it with their writing talents in such a way that it all feels new yet familiar. It was cool seeing Bill Mumy aka the original Will Robinson play the part of the ill-fated Dr. Zachary Smith and as someone who was a fan of the first series from its black & white start to its technicolor end, I highly endorse this re-imagining. I rate this first season a rating of 4 & 1/2 out of 5.